Gondola ride ticket: a 30-minute in Venice at an unbeatable price! A gondola ride in Venice is a must-do experience providing unique emotions… you have to try it at least once in your lifetime! You can book a private gondola for yourself, or share it for a 30-minute ride at a very affordable price! You can’t think of Venice without imagining a typical Venetian Gondola! From the famous Grand Canal,spanned by the majestic Rialto bridge, to the edge of st mark’s square, or gliding under the Bridge of Sighs, you will see gondolas everywhere! A private gondola ride in Venice (link pm) along the city’s canals is definitely an unforgettable experience! Do you have a tight budget? Here’s a great solution! Our gondola tours shared with other people cost only 32 euros! Find out more here. 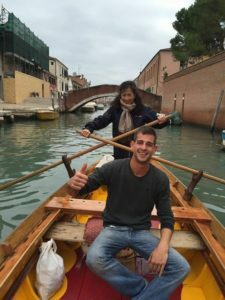 Private gondola ride in Venice: what are the options? Our expert gondolier, in his classic blue and white outfit, will host you along the Grand Canal. He will also explain how to row the Venetian way and why you use only one oar! Relax on the typical red velvet armchairs draped with golden tapestries and let yourself be carried along by the waves. Float gently along at the relaxed pace of the gondola, and take in the sights and sounds of Venice that surround you. A traditional gondola ride along the canals of Venice is the most authentic way to experience this unique city. Enjoy the stunning views, the majestic buildings and appreciate the beauty of this city of the doges and absorb the history of Venice. You can admire elegant architecture, unique bridges and watch Venetian life go by. 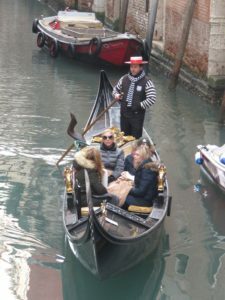 -Private gondola ride venice -the most exclusive gondola experience. 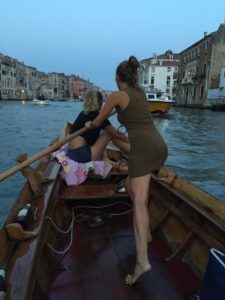 On a budget but don’t want to miss out on an authentic gondola experience? 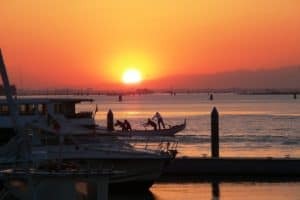 Well you can step away from classical Venice, head out to the northern lagoon and try the gondola at sunset from there. Enjoy an aperitif at your leisure in the peace and quiet as the sun slowly sinks below the horizon. First you must get to the meeting point of Cavallino Treporti, a famous seaside resort. This is easily done in just 20 minutes by vaporetto. You will then board the gondola for 90 minutes of tranquil sailing from the Marina Fiorita dock. Included with this gondola tour of the northern lagoon is an evening aperitif. After departure from Cavallino, you will be able to enjoy this special time of day for wildlife on the lagoon and sample a bottle of vintage Veneto prosecco. Venice by gondola, discover the secret of Venetian rowing! 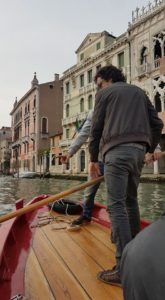 If you want to try a unique “Venetian” experience, but prefer to stay in the city then why not try your hand at rowing yourself? We offer a rowing course based in the Cannaregio district, suitable for adults and children! The rowing lesson will last 90 minutes, during which you can make your own way through the city by water!. Experience Venice city through its smaller canals, many of them hidden away, and above all learn to row like a real gondolier! Gondolas in Venice: the most exclusive tours! If money is no object and you want the most exclusive private gondola ride in Venice then this could be the choice for you, To be certain to give yourself a unique, unforgettable experience, we suggest you to choose one of our private gondola tours from 30 minutes up to an hour or two! Choose whether to take your private rides by day or after sunset, with prices starting at € 105. Contact us to discuss what you would like included on your exclusive tour. Free for children under the age of 2, who will seat on the parents’ nap. Should you cancel the experience up to 24 h before the ride, a 10% fee will be withheld. There will be no refund in case of a NO SHOW or cancellation within 24 h from the ride start. Departure at 11.00, 15.00 and 17.15. Meeting point: Calle Larga de l’Ascension (on the side of St. Mark’ Square) at least 15 minutes before departure.